Thank you to everyone for commenting on my post about hoop skirts! There are so very many statements out there, both from the period in a satirical or curmudgeonly vein and from secondary sources that don't take the biases of their primary sources into account. And unlike other pervasive myths I've looked into or seen other people look into, there aren't many period sources that can be used to discredit it. You can find a little black dress from before Chanel or an article on the benefits of a brown complexion from 1901 or descriptions of Andalusian fan language in a travelogue, but people did not tend to publish what the actual experience of wearing a hoop skirt was like. I can research the actual proportions of fashionable and ordinary skirts from period images, but they don't tell me how quickly people tend to get used to the size, how often they generally knock things off tables, if it really is hideously difficult to go through a doorway or down a staircase, etc., giving me a starting point for study and probably more in-depth conversations through email. This weekend, I've been working on getting together a wearable mockup of a Regency corset - machine-sewn for speed, I'll take a pattern of it when I'm sure they fit properly and make another set by hand - and now I'm getting out the scrap sheet to make a quick mockup (for a wearable mockup) of the 1840s corset in Waugh, or for this corset at Winterthur (leaning towards the latter as doing the gussets in he Regency mockup was pretty painful). Let's get both of the corsets out of the way! I want to start making outerwear, especially as I've had some fabric set by for a ca. 1840 dress for a long time. My most recent Etsy item is also my favorite. 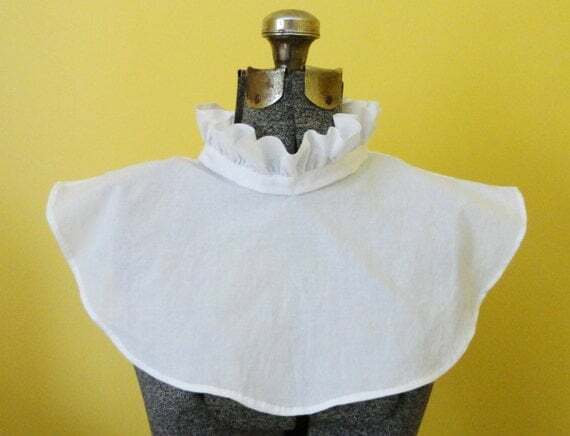 The frill/tucker can fill in a lower neckline or just hold the ruffled collar for a higher one. Thanks for this! I am struggling with making a late Tudor(ish) corset--not my first, but lots of unknowns to grapple with, primarily my actor living 30 minutes away. This is also my first stab at a corset that doesn't somehow reshape the waist, and must be correctly structured to hold up a farthingale and skirts, and possibly have bodice elements attached? Making it up as I go, depending on the last variable, which is HOWMUCH stash do I have?? I am doing this on the machine, largely because the actor and audience couldn't give a tinkers fart about proper period construction! Keep us posted on how this goes! Corsets and stays ARE such a struggle! At least the pieces tend to be simple enough that using a machine isn't more trouble than it's worth - I tried some 18th century gown sewing on the machine a while ago and wanted to throw it out the window.